I remember crying in my room at my mom's house whenever I'd glance over at the world map. Botswana is a LONG way away from home. I remember frantically packing my bags the weekend before I left for Botswana & worrying about my dad who was just released from the ICU. 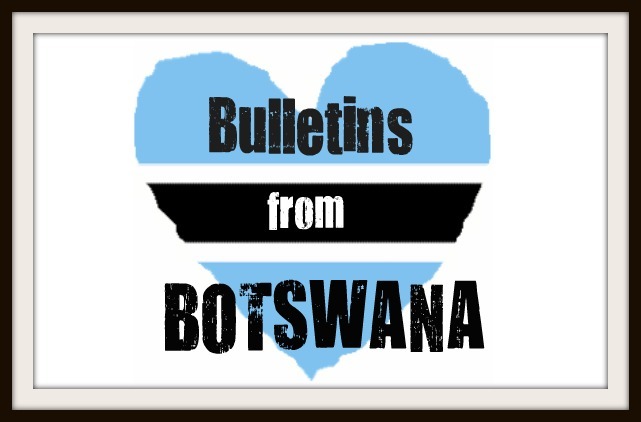 I remember the anxiety and anticipation I had when I first boarded the plane for Botswana. I remember the hugs I received from every member of my host family in Kanye, who welcomed me into their home and hearts. I remember the frustration of trying to learn a new language, Setswana, and later, the frustration of trying to learn a different dialect, Sekgalagadi. I remember enjoying the company of each member of my training class and all the memories we made during our first year of service. I remember the excitement of FINALLY knowing where I would spend my two years in Peace Corps… Kang, Botswana. I remember the first night sleeping alone in my house in Kang, without electricity, without knowing a soul in my village. I remember wondering how I could ever survive two years in the desert village I finally ended up in. I remember my first few months at site, trying to figure out my role within the village and how I could help people the most. I remember thinking this was too hard, what had I gotten myself into, I didn't have the skills, patience, or ability to do this. I remember falling in love with my new family in Kang and forming relationships that will last a lifetime. I remember the joy of working with youth development. I remember the children who ran alongside me as I made my way running through the village at sundown. I remember the unremarkable kindness of strangers. I remember the first time thinking, "This is my home. This is really where I belong." I remember walking through my village with the sound of my Setswana name, Boitshepo, echoing through the air. I remember falling in love with who I am, with who I am becoming, and with where I am in life. I remember thinking I still have so much to learn, so much to do, and so much more to accomplish. I remember coming home to children running up to me for hugs & kisses. I remember the happiness I felt when people came knocking on my office door to seek me out for help, rather than me offering first. I remember finally feeling like something was getting done. I remember the first time I felt "homesick" for my home in Botswana, rather than the United States. I remember the smiles from people I've helped along the way, thanking me for my time and investment in their future. I remember realizing for the first time, there are many things I think I cannot do that I actually can do. I remember people rejoicing to be transferred out of my village to a government job in a bigger city - leaving without looking back. I remember thinking I couldn't leave. If I leave, who will stay? I thought. I remember holding hands with home based care patients when I went to visit them in their homes… most often, finding them on a small foam mattress pad on the ground, clinging to what life they have left in their bodies, and somehow, still smiling at me each time I came to visit. I remember attending funerals of people I came to love in my village, all of whom died from HIV and opportunistic diseases. I remember feeling part of something bigger. I remember hitting my ONE YEAR mark in Botswana and thinking there is so much yet to come.